These are delicious! They’re a little bit thicker than a corn chip, but not so thick you feel like you’re eating a biscuit. They’re nicely salted and you can taste the corn. In addiction to being gluten free, they’re also soy, dairy and egg free. We had them as nachos and they held up well against the meat and sauce and didn’t get soggy, and then I ate the rest as chips. I’ve since bought a second packet because I liked them. Crunchy Tasty Strips of Yum! This product is great for dipping and copes well with hot or cold style dips. Leftovers stay fresh for an extremely long time in a sealed plastic container without loosing taste or crunch. Authentic and easy to eat. The square rectangular shapes are great for dipping and the chips are crunchy and do not break easily when duping. The chips also keep well in the bag. They don’t taste artificial as it has no seasoning other than a little salt so it’s very healthy tasting. The only difficulty is opening the packaging. It seems to be sealed tightly with some sort of machine press so it’s super hard to open and I just cut the top open with scissors. Even so, the bag rolls up and seals decently and as we like the chips so much, they get eaten in one go so it’s not an issue. Not something I would eat too often, but once in a while I enjoy eating them, with avocado and other dips. Great bag size, nice crunchy, they keep very well in the pantry! These are a really tasty tortilla chips, and I really love the original shape that they come in, – something different. They are not as strong or artificial as doritos. Tortilla chips are yummy chips and Mission Tortilla Strips White Corn are yummy too. I like the size of the chips and the taste of the chips. A substantial chip which can be eaten individually and in a recipe. 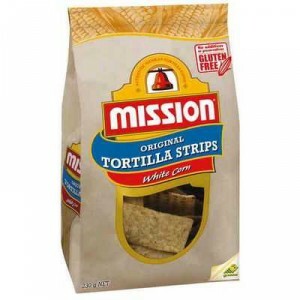 How would you rate Mission Tortilla Strips White Corn?